41 year career as an official at the high school and collegiate level (1950-1990). CIAC tournament official for 33 years. NCAA Division I, II, III, NAIA and ECAC tournament official for 26 years to include five NCAA Division I National Soccer Championship Finals. Honorary Life Member and Charter Member of the Western Connecticut Soccer Officials Association (1956-1990), New England Intercollegiate Soccer Officials Association (1958-1979), National Intercollegiate Soccer Officials Association (1964-1979), and the Connecticut Soccer Officials Association (1971-1990). 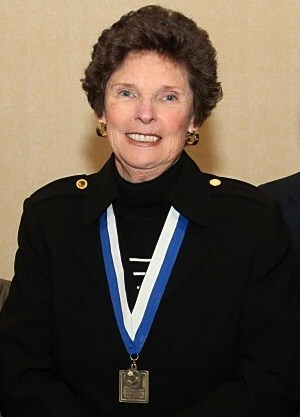 Distinguished Hall of Fame Member of the National Intercollegiate Soccer Officials Association (1979) and National Soccer Hall of Fame Member (1995). 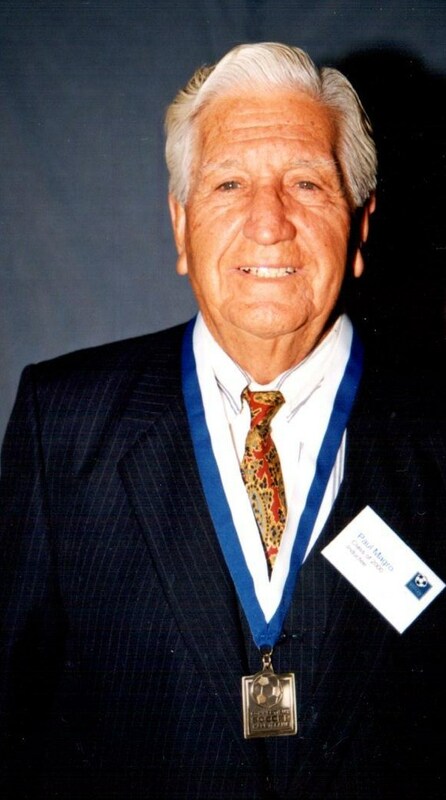 Founder, First President and drafted the original constitutions for both the Western Connecticut Soccer Officials Association (1956) and the Connecticut Soccer Officials Association (1971). The latter being the first state soccer officials association in the United States. Official New England NCAA Intercollegiate Soccer Rules Interpreter (1968-1978), High School and NCAA Soccer Rules Interpreter for Western CT Soccer Officials Assocation (1956-1978), and Official State of CT High School and Collegiate Soccer Rules Interpreter (1971-1977). As first Chairman of the National Intercollegiate Soccer Officials Association "Mechanics Officiating Committee", directed and published thier first official publication "Manual of Soccer Officiating", which established the official mechanics for the Dual System of Soccer Officiating in the United States. The CT Soccer Officials Association presents annually "The Paul Bourdeau Class "M" CIAC State Tournament Boys' MVP Award" and the Western CT Soccer Officials Association presents annually the "Paul Bourdeau Outstanding Service Award" to a CT individual in recognition for his/her outstanding contributions and service to soccer and/or soccer officiating. Inducted into the U.S. National Soccer Hall of Fame in 1986. 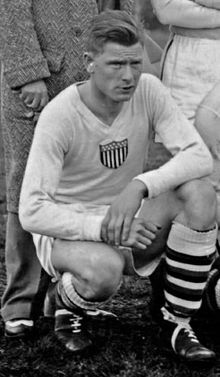 Played all three games for the United States in the 1930 World Cup and scored the only goal against Argentina in the semi-final loss. Scored 17 goals in 40 games for Manchester United (1932). Had an 8 year professional career in England and Scotland (1932-1940). During his US and UK professional career, he appeared in over 444 matches and scored over 295 goals US (52) and UK (243). Coached the Greenwich High School Soccer Team in 1950-1951. Head Coach at Brunswick School in Greenwich, CT (1953-1974). Coached the United States Women's National Team to the 1999 Women's World Cup title, 1986 Olympic Gold Medal, and 3rd place in 1995 Women's World Championship. Overall 103-8-8 record with the United States Women's National Team, making him the most successful national team coach in United States Soccer history. Assistant Coach of United States Women's National Team 1991-1994. Won National Championship at Springfield College and was named All-American in 1968. 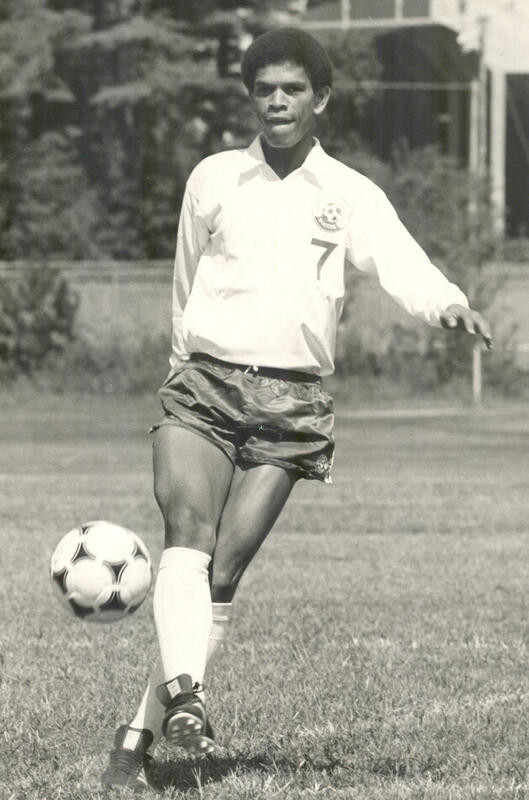 Played five years in American Soccer League for the Connecticut Wildcats (1973, 1974) and the Rhode Island Oceaneers (1975-1977). First pick in the 1981 NASL draft by the Tampa Bay Rowdies. 1982 NASL Rookie of the Year Award. NASL with Tampsa Bay Rowdies (1982,1983) and New York Cosmos (1984, 1985). Won MISL Championship with Dallas Sidekicks (1987). University of Connecticut team assist record with 20 (1979 & 1981). Led University of Connecticut to the NCAA National Championship (1981). University of Connecticut record of 59 career assists. Collegiate All American (1980, 1981). Finished second in the 1981 Hermann Trophy balloting. Played in the 1981 Senior Bowl. CJSA Secretary from 1978-1984. First Administrator/Executive Director of CJSA (1984-1993). Guided CJSA from grassroots organization into a professional association with a corporate office. Instituted the CJSA Convention and the High School Senior Bowl. Organized the 1991 USA/Norway game at Willow Brook Park, New Britain, and established a new attendance record for a women's match in the United States (US vs Norway). Co-founder of the Avon Soccer Club. 1990-1995 Served as Head of Delegation for Women's U19 and full National Team when traveling abroad. Executive Venue Director of US Cup 1993 at Yale Bowl (US vs Brazil). This was the first million gate for a men's or women's U.S. National Team game. Recipient of the Outstanding Contributor Award from the Connecticut Junior Soccer Association in 1987. Deputy Commissioner of Administration for the 1995 Special Olympic World Games. E.D. for U.S. Men's National team games at Yale and Willowbrook Park including Italy, Portugal and Ireland. 2006 Recipient of Avon Citizen of the Year. Named Life Member of Connecticut Junior Soccer Association. A pioneer referee in Connecticut from 1968-1977. Adopted higher standards for referees by creating the Connecticut Soccer Referees Association. Introduced and organized formal referee training and certification in Connecticut and wrote the first booklet on testing and educationg referees. Top notch American Soccer League, Connecticut Soccer League, and Connecticut High School referee, and North American Soccer League linesman in the 1970's. Organized soccer program at Westledge School in Simsbury, CT and coached from 1969-1977. Played for the Italian-American Stars from 1951-1955 and won state championship in 1954. I-A Stars Soccer Committe Member 1966 (U.S. Amateur Cup 2nd place) and 1967 (U.S. Amateur Cup Champions). President of the Connecticut Referees Association in 1956. Connecticut Soccer League Referee 1956-1974. Coached the Hartford Soccer Club of the American Soccer League in 1968 and 1969. 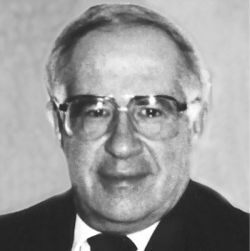 President of the Connecticut State Soccer Association 1973-1974. Founded the soccer program at Hamden High School in 1963 and coached until 1994. Overall record 274-162-38. Received the 1993 National High School Coach of the Year Award from the National High School Athletic Coaches Association. Executive Board Member of the Connecticut Soccer Coaches Association rom 1978-1993. USSF Registrar for Connecticut in 1966 and 1967. Received 1987 Service Award from Connecticut Soccer Coaches Association. 1992 Nutmeg State Games Coordinator of the Year. 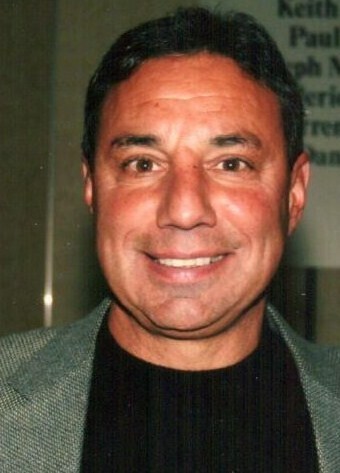 1992 Connecticut Soccer Coaches Association Coach of the Year. 1996 Nutmeg State Games Living Award. Played NASL for Tulsa Roughnecks and the San Jose Earthquakes 1981-1986. 1981 NASL Rookie of the Year Award. First pick in 1980 NASL draft. 3-time All-American at University of Connecticut (1978-1980). 1980 Hermann Triphy winner. Holds 4 individual records at University of Connecticut. Played in the 1980 Senior Bowl. Midfielder for the United States in the 1979 Pan American Games and the 1977 and 1978 National Junior Team. Midfielder for the 1980 United States Olympic Team. E.O. Smith High School All-American and State CHampion, 1976 and 1977. Coached Mitchell College in New London from 1958-1968. Reached the national championship game four consecutive years (1962-1965). Won Junior College National Championship in 1962 and 1964. Overall record 99-32-4, including period from 1962-1968 when his teams won 78 games, lost only 10, and tied 3. Coaches the first Connecticut State Team in 1971 and continued for twelve years. Never had a losing season with Connecticut State Team. Served as First Vice President of Connecticut Junior Soccer Association and is a Life Member. Youth Development Director for Hartford Bicentennials. Head soccer coach at Ledyard and Waterford High Schools. Covered Staples High School Soccer for the Westport News (1969-1971, 1975-present). Executive Youth Editor of Soccer America's Youth SOccer Letter. Frequent contributor to soccer magazines Soccer Journal, Soccer Junior, and U.S. Youth SOccer. Authored four soccer guide books. Seven-time award winner of the Professional Soccer Reporters Association writing contest. Two-time winner of the NSCAA writing contest. 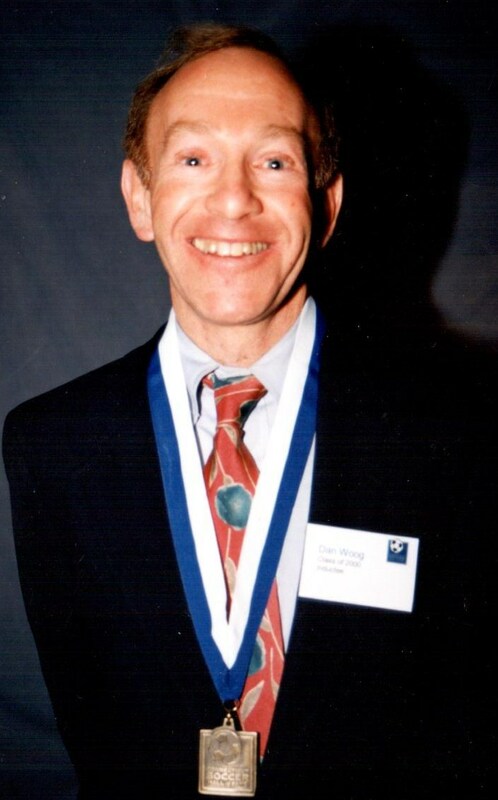 Recipient of the 1986 NEISL Media Award. 10 CJSA state championships at the U12, U14, and U16 levels. 1980 CJSA Coach of the Year Award. 1990 NSCAA National Youth Coach of the Year. Co-founder of the Westport Soccer Association in 1975. Appointed head coach, Staples High School boys program, 2003.